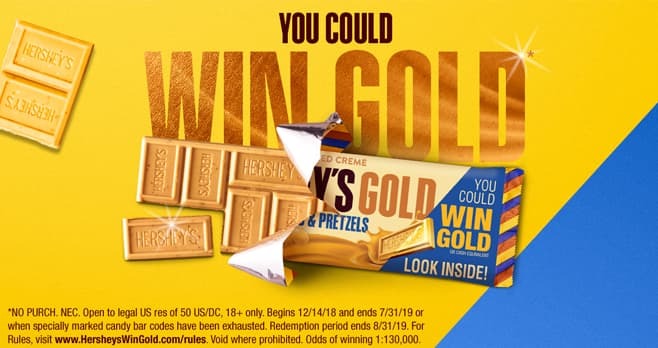 Purchase a specially-marked HERSHEY’S GOLD candy bar during the Hershey’s Gold Rush Sweepstakes and look for a code and a chance to instantly win the bar’s weight in 24K Gold. Visit hersheyswingold.com for rules and details. The is open only to legal residents of the United States residing in the fifty (50) United States and District of Columbia who are eighteen (18) years of age or older at the time of participation. The Sweepstakes begins on December 14, 2018 and ends on July 31, 2019. The grand prize consists of a 6.5 ounce 24K Gold Bar. Visit hersheyswingold.com to enter and see Official Rules for details. Hershey’s gold candy bar appears to have a number of different flavors in one gold bar . I would like to try a gold candy bar to see if the flavors are for me .